This is an experiment in blogging - I don't know that it will be much different from posting messages on Yahoo Rughookers (http://www.groups.yahoo.com/group/rughookers) but I thought I'd try to find out. 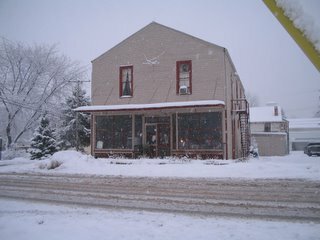 I do my hooking and blogging in an old store building in the old village of Hamburg in southeastern Michigan. The store was built in the 1830s when Michigan was first being settled. It's a huge space, really two old buildings that have been connected for more than a hundred years. I hear all sorts of stories from people who grew up in this village, this building was an important part of their childhood - there were big dances and parties held here, there were bingo games that filled both the front hall and the back hall - the speaker wires still run around the rooms and down the hallway. There was a pool table in the back hall and shuffle board was painted on the floor in the front hall. I've had the building for ten years and have made very few changes. I changed the paint color on the outside from white to beige and upset a lot of people. The main part of the building was a hardware store. I used to bring my farmworkers here to buy rubber boots and work gloves 20 and 30 years ago. Above the hardware is a high ceilinged room where the dances and parties were held, and that's where I have my rug hooking studio. I am gradually filling one wall with bookshelves filled with wool. The back part of the building was originally a blacksmith shop with a second story that was probably a basic barn loft - you can still see the remnants of a barn loft door in one of the exterior walls. It was probably a residence at sometime, too, since there was wallpaper on some of the hidden walls. The barn loft now has plaster walls and was the kitchen and dining hall for the lodge that used to own the building (the IOOF, or Oddfellows). I use it as a weaving studio and doggy day care center. I have my fibre arts upstairs and an antique shop downstairs. After seeing your quaint farmhouse pic and reading your lovely story I now have a radically different view of you and your surroundings. Where in the world did I get the mental images of you sitting in an almost 'too hot' room with everything close to your fingertips!?!?! I'll have to explore my preset images of rughookers whom I've never met. I hope you write MORE interesting stories on the old buildings which are a part of your life, your travels and precious memories, including those of your mother.